Sasha's Fine Foods and UFIT…a partnership made in clean eating heaven! It gives us a real buzz when we have the opportunity to work with like-minded businesses that share our outlook on health and wellbeing so it’s with real pleasure that we’re teaming up with UFIT for their four-week Clean & Lean Challenges. These challenges are for everyday people wanting to achieve a cleaner, healthier and more sustainable lifestyle over the long-term. To support this partnership, we are delighted to launch our Clean & Lean Boxes, designed with the requirements of participants in mind. They are also the perfect way to continue on your path to healthier ways, long after you’ve conquered the Challenge! You can therefore get a taste by signing up below for a 10% off code. 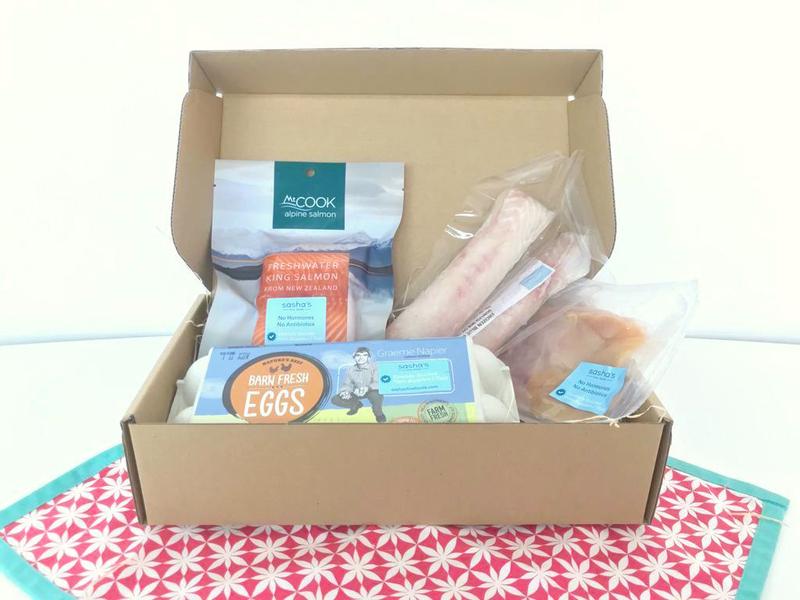 Use this when purchasing one of our 3 Clean & Lean Boxes below or your first purchase on sashasfinefoods.com and we will also enter you into the prize draw to win our exclusive ‘Clean & Lean Meat & Seafood Box’ pictured below, packed full of hormone and antibiotic free Chicken, Mt. Cook Alpine New Zealand Salmon and the finest New Zealand Blue Cod in the world. How’s that for a thank you and the very best way to kick start your Challenge?! So grab your code now and get right on track to reach your Challenge goals, whether it’s fitting into that new pair of jeans, toning up or just enjoying some new found energy by eating clean, healthy, nourishing food, as nature intended. Whatever your aim, we wish you plenty of luck, sweat and cheers! Stand a chance to win a Clean & Lean Meat & Seafood Box by using the 10% discount code when placing your first order with Sasha's Fine Foods between 23rd October to 22nd November. You will then be, automatically entered for this fabulous prize! The winner will be announced on 24th November 2018 on our Facebook page. Sign up using the following form and the code will be sent to the email address you provided automatically. Products are automatically delivered according to your chosen schedule. You will receive a reminder 3 days before delivery and can change or cancel your subscription at any time. Sasha’s Fine Foods is no ordinary grocery store. What makes us special is the way we source our products. Sasha personally visits every farm to understand where and how animals are raised, to look at the surrounding environment and to meet the people involved. Because of this, we can confidently say that our products are high-quality, tasty, clean, and free from growth hormones, antibiotics or any nasty additives. We build trust by doing what we promise. Word of mouth is how we acquire new customers so we cannot afford to fail any customers. At Sasha’s Fine foods we love to support the "small guy", the local farmer who is trying to farm in the right way and to help him avoid resorting to mass production where all his principles have to be uncomfortably buried in order to make a living. Though many already love our products, we never stop improving ourselves as we want to always deliver the best products, customer service and experiences to our customers. Sasha’s Fine Foods also offer same day delivery. Order by 3pm and you can receive your produce on the same day! The event starts on 23rd October and ends on 22nd November. 1 winner will be announced through Sasha's Fine Foods social media on 24th November. We reserve the right to take photographs of the winners and publish the images in any form, in whole or in part, and distribute them in any medium including the Internet - sashasfinefoods.com, email marketing and social media channels. The 10% code cannot be used in conjunction with any other code or offer.